The place was laid back and relaxing. 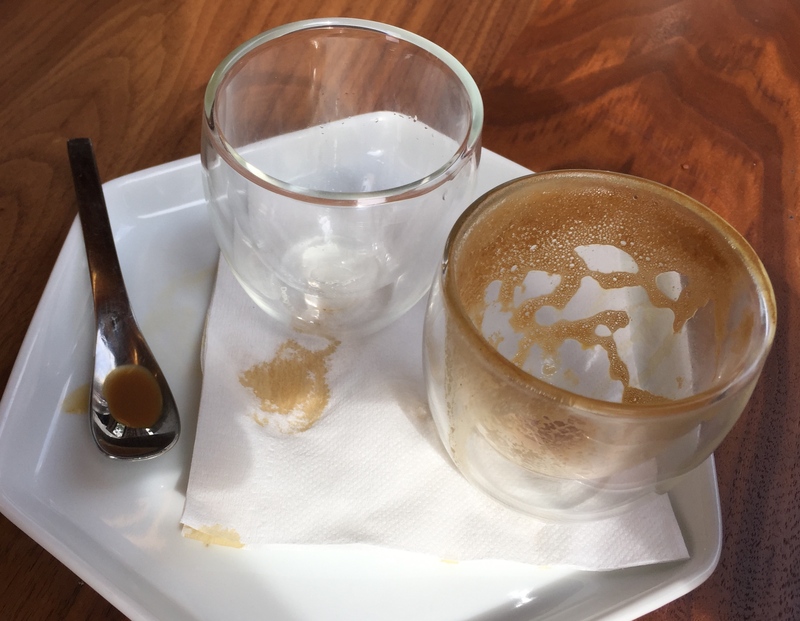 The coffee was even better than we imagined. Yes, surfboards were sold in the same space along with belts, hats, bags and other miscellaneous stuff. In addition, we noticed that the furniture was quite unique, artistic. 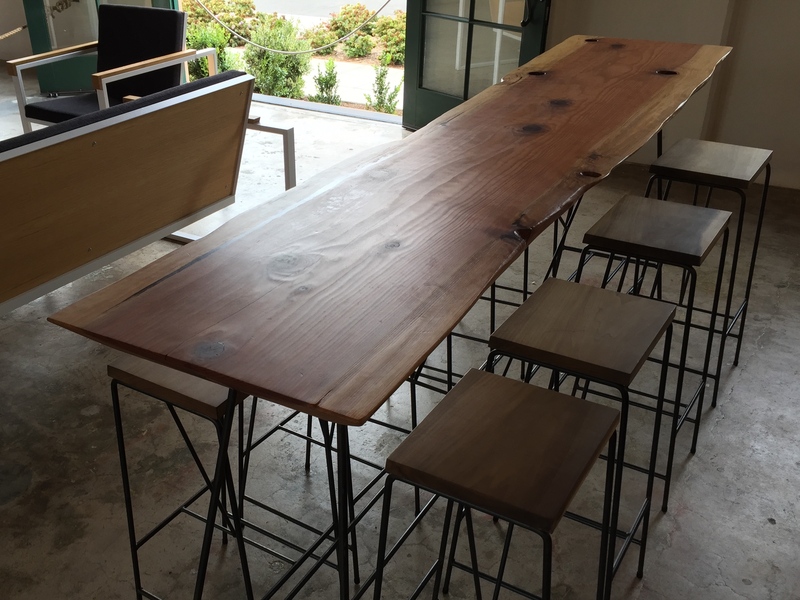 Every detail was just right—beautiful woods, custom ironwork, so we asked the barrista where they got the furnishings. He casually said, “We made them!” almost as if that was normal. He added, “Everything is for sale if you like it!” Yet we saw no price tags. How interesting! After digging a little deeper with multiple questions and a few clues, we jumped back into the car, and headed for the “Moniker Warehouse” in San Diego’s East Village. 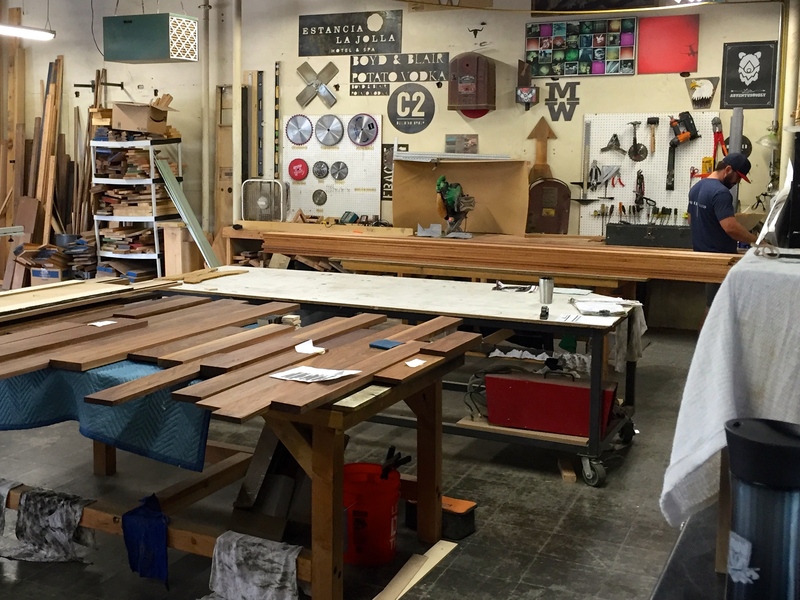 There, on 16th Ave, between F and G, we found “Moniker Made,” their furniture design and production space. 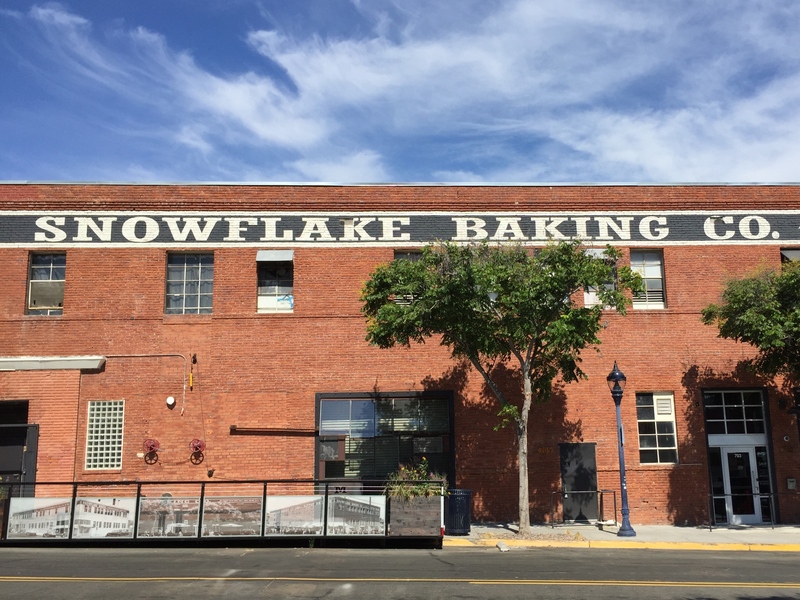 The Warehouse is in an old historic landmark called Snowflake Bakery. 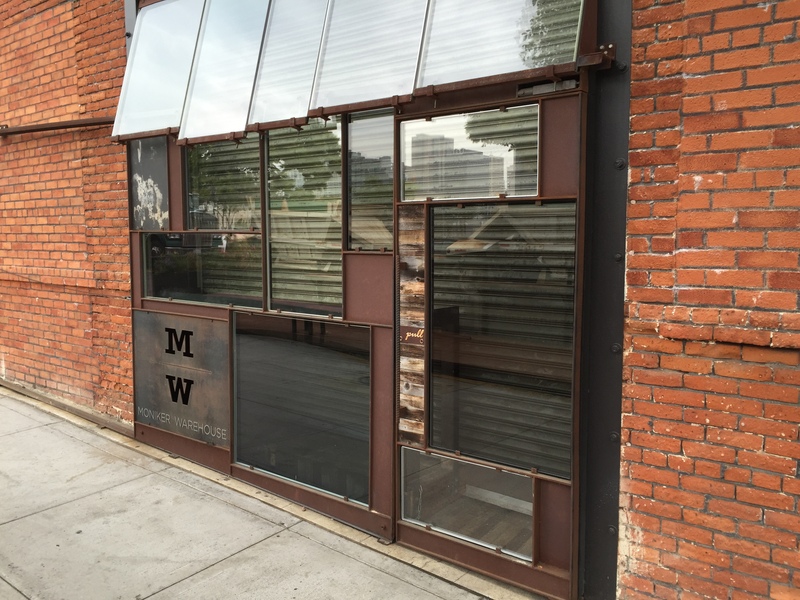 The long brick facade now sports a fantastic artisan-made steel, wood and glass door. We wanted to see more. Upstairs, we found Judy who was kind enough to lead us through the Warehouse, passing an assortment of shops, offices, and open work areas, many of which were just smaller spaces within a larger loft-type room. No frills. There is an event space just waiting to be customized as needed; Judy’s Awards-Engraving-Sublimation studio; a surfboard shop; and a leather/canvas manufacturing business with a tent covered showroom. It felt like a relaxing summer campground. Other shops included a small artists’ studio; amazing laser engraving and more. 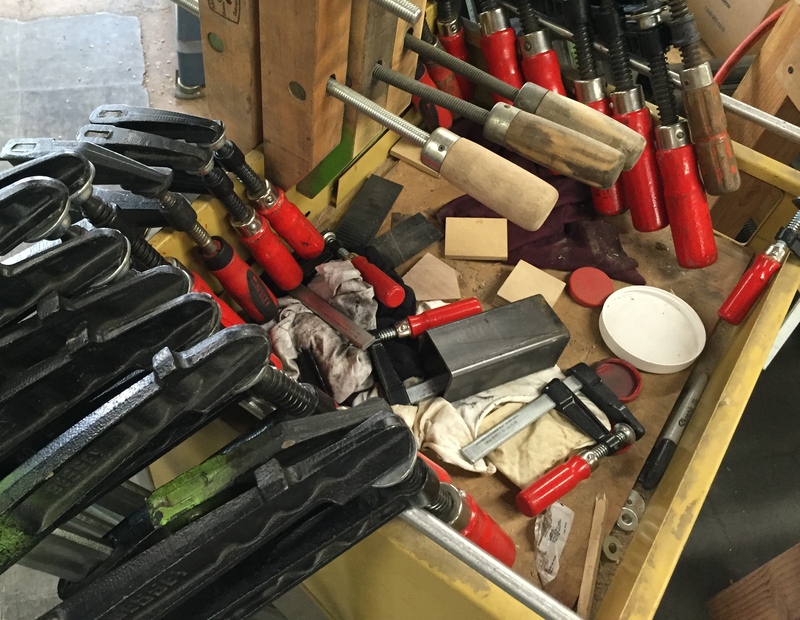 Finally, way in the back, we came to “Moniker Made,” where artisan James showed us around their wood/iron furniture workshop. The entire Warehouse was literally filled with boot-strap, start-up entrepeneurs all doing their own thing, yet, also working in close collaboration with each other. It was fascinating! “The Moniker Warehouse exists to generate stories, produce events, and facilitate good work. What began as the catalyst for Moniker Group is now home to a growing family of more than 20 entrepreneurs and organizations, each contributing to the East Village’s revitalization, emerging art, and maker movement. We left the Warehouse truly inspired exactly as predicted! The stated values for the Moniker Group are Professionalism, Creativity, Humility, Empowerment and Balance. It appears that there are several visionaries who founded the idea of the Moniker Group in 2010, and turned it into reality. Of course, it’s not obvious who they are since one of their values is humility. Wow! How refreshing to see grass roots community endeavors that thrive on individual passions and a philosophy of cooperation—not competition and profit. Everybody wins! And if everybody wins, doesn’t that portend a more cohesive, more evolved and wonderful world! A cup of coffee never tasted soooooo Good!